I wrote in French Window about the options for working indoors looking out when the Mistral blows in France. This post is about what happened when I ventured out on the day before! Strictly speaking when the Mistral blows you might be challenged as to whether you are really doing plein air sketching in the open air if the air is whipping up a storm and you have to retire to the inside of your car with all the windows closed! That was the predicament I was faced with when I visited a small village in the Languedoc Rousillon departmente of south west France . There was really no prospect of sketching outside unless one had a good wind break, so I decided to tough it out - in the car! This is a colored pencil study on apricot coloured Canson Mi Teintes. It is approx A3 size (16.5" x 22.5") and was produced as I sat in a car for about a couple of hours. It's of the stunning view (with stunning wind!) from the promenade at the top of Fanjeaux - which has very strong associations with St Dominic and the Dominican brotherhood and activities around the time of the Cathars. I've also included the quick study I did before I started. In this you can see how I divided the picture plane into rough thirds and aligned some of the major lines within the image with the third divisions - so the line of umbrella palms sits just above the mark separating the bottom and middle third, while the line of trees going into the distance sits on the vertical division between the middle third and the right hand third. 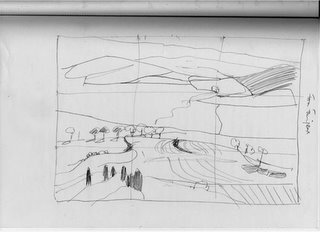 It's not a wholly accurate drawing so much as way of working out which are the major marks within the image, how they work and where they might best be situated within the picture plane. an aerial perspective - which is the effect that the atmosphere has on the colour of objects as they recede into the distance. Generally objects look bluer and more blurred than similar objects seen close to. Of course, the joy of working with colour pencils in such situations is that there is no potential for nasty paint marks in the hire car! The big challenge on this one was getting the optical mixing right when developing the blues and violets (associated with the aerial perspective) of the distant hills. What I intend to do is use this colour study to produce a more finished work in due course. I usually check both the drawing and the proposed crop back to photographs taken at the time and then use the colour study (rather than photographs - which as we all know are notorious for getting both values and colour wrong) as the basis for my studio work. 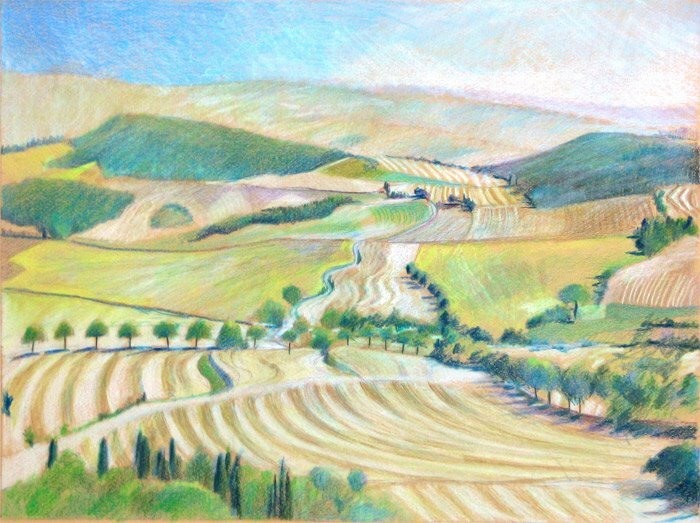 I always wish I could see your pieces in person---colored pencil marks never translate exactly in reproduction. 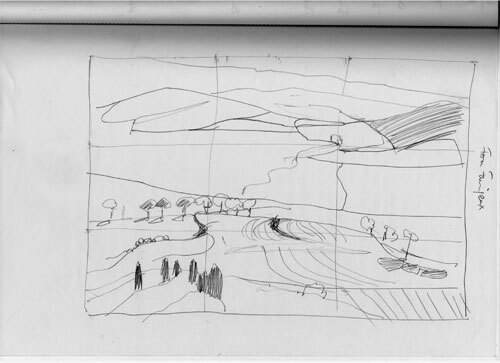 I do love this sketch and the story behind it. Wonderful job, K.